What can I use to combines ingredients instead of peanut butter when making Oreo Balls? 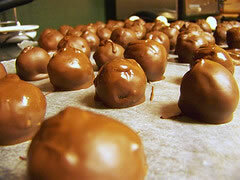 I want to make Oreo balls. They are just like peanut butter balls but made with Oreo cookies. I need to figure out what I can use to keep the mixture together instead of peanut butter so they will taste like Oreos and not like peanut butter. Chocolate for dipping - whatever kind you like and whatever color you choose. These are so easy to make, and well worth the effort. Crush the Oreo cookies using a food processor, blender, or Thermomix. If you don't have any of those, you CAN put the cookies in a plastic bag and give them a good bashing with a rolling pin, but you'll probably find it's a bit messy and "gluggy" that way. Save that as a last resort! Combine the softened cream cheese with the crushed cookies until well mixed. Form balls and place on a wax paper lined tray to chill. You can refrigerate or freeze these to get them nice and firm. Melt your chosen chocolate over a double boiler or in the microwave (don't overheat). 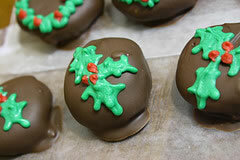 Dip the balls into the melted chocolate and return to tray to set. You can dip using a toothpick, but you may find a dipping fork or dipping spoon much more effective. For added eye appeal, you can drizzle or decorate the Oreo truffle balls with contrasting colors or colors related to the holiday, special event, team colors, etc. I also have it on good authority that these treats can be made up in advance and frozen for at least a month, and they are still delicious! 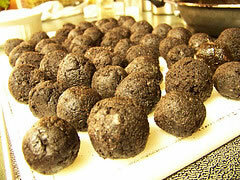 Everyone will love these yummy Oreo Truffle balls. You'll likely get requests for a long time to come. Hope that solves your problem Susan! Have fun making them. I've added some photos above courtesy of ladybugkt on Flickr. She did a fantastic job! 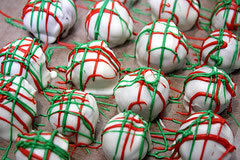 Frosting may work too, that is what is used to make cake balls so you could try it with the oreos!